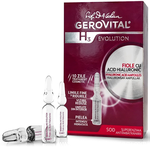 BEST PRICE WORLDWIDE Gerovital Vials - Gerovital H3 (procaine hydrochloride) original formula made by Romanian Prof Dr. A. Aslan. Ampoule series: One injectible ampoule on Monday, Wednesday and Friday in every week of the month = 12 ampoules/month. One month break or alternate with one month tablets treatment. 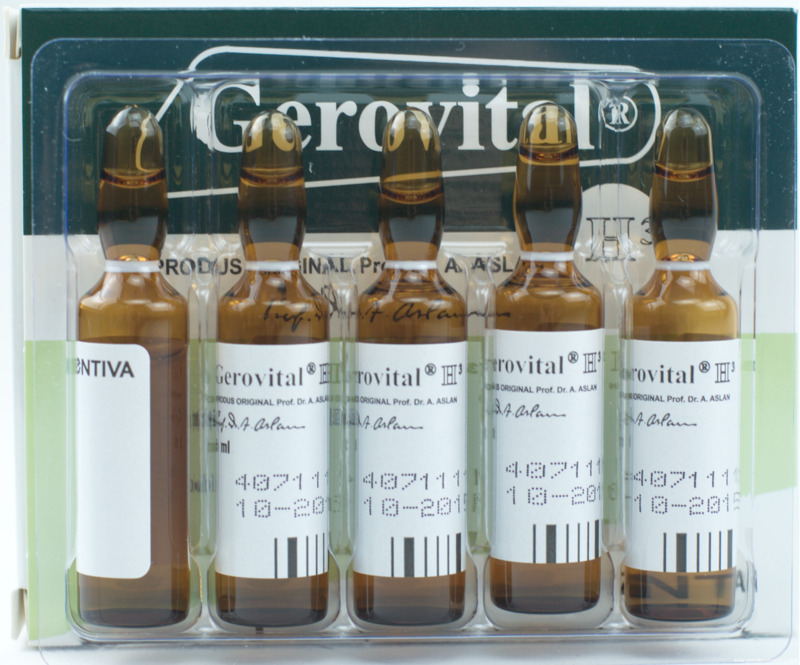 About Gerovital: Discovered by Prof. Dr. Ana Aslan at the Geriatric Institute of Bucharest, in early fifties it is produced until now in the Bucharest factory. This unique nutritional formulation has been described as "The Fountain of Youth", and is estimated to be in use by more than 10 million people in more than 70 countries worldwide. Being the first anti-aging therapy, Gerovital H3 reduces free radical activity, preventing damage to DNA and cellular membranes. The complex effects of Gerovital-H3 are, due to its activity, both at the level of the central and neurovegetative nervous systems, and at the level of the cells. The product has been proved to act in the oxidation-reduction phenomena of the cell, stimulation of tissue regeneration and the improvement of metabolic processes. Has been proved that help also in treatment of: Parkinson's, spondylosis, arthritis, osteoporosis, neurodermitis, eczema, alopecia, psoriasis, arteriosclerosis, vitiligo, sclederma and many others. Before starting the treatment with Gerovital® H3 it is compulsory to test individual sensitivity to procaine, as follows: 1 ml from the injectable solution of Gerovital® H3 will be administered subcutaneously and after 24 hours the test should be repeated with 1.5 ml solution intramuscularly. If any allergic reaction occurs, the treatment is not recommended. 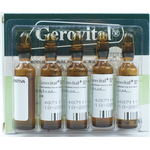 The recommended dose is 5 ml (1 ampoule) of Gerovital H 3 intramuscular injection 3 times a week (1 vial of Gerovital H 3 solution every two days) for 4 weeks. The recommended dose is 2 Gerovital H 3 tablets daily, after meals, in the morning and in the afternoon for 12 days. The treatment series will be followed annually, continuously or with a one-month break between them. The schedule and frequency of breaks will be decided by the geriatric physician, depending on the condition of the patient. 4 - th week: 2 ampoules (10 ml) intramuscular injection/day, 3 times a week. The treatment should be repeated 4-5 times a year. Sugar-coated tablets: during the pauses in injections series, 1-2 tablets/day for 12-18 days/month, can be administrated. Injectable solution: 1 ampoule (5 ml) intramuscular injection/day 3 times a week for 4 weeks. The treatment should be repeated 5-6 times a year. Sugar-coated tablets: between the injections series, oral treatment may be added - 2 sugar-coated tablets/day, 12 days. *Hypersensitivity to procaine in antecedents or tested. *Associated treatment with sulfonamides (except the antidiabetic ones) and with acetylcholinesterase agents: neostygmine, eserine (physostigmine) and pyridostigmine. Before starting the treatment, a test for individual tolerance to procaine should be made (see under Posology and method of administration). The treatment must take place under medical supervision, mainly in the first series of treatment, in order to establish the optimal dose. Although procaine medication is not carcinogenic, it is not recommended to the patients with cancer, as its stimulating effect on mitotic potential of the neoplasic cell is not excluded. Gerovital® H3 should not be administered simultaneously with sulphonamides (antagonistic mechanism of action) - except the antidiabetic ones, anticholinesterases: neostygmine, eserine (physostigmine) and pyridostigmine. Pregnant and breast-feeding women: the studies on animals did not show teratogenic effects. In absence of teratogenic effects on animals, malformative effects on humans are not expected. 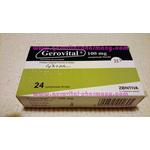 However, the clinical experience with Gerovital® H3 is mainly on patients over the procreation period. For these reasons we do not recommend the use of the product during pregnancy and lactation. Potential effect on the ability to drive or to use machines: the product does not interfere with these abilities. Administration of Gerovital® H3 may produce allergic reactions in patients with hypersensitivity to procaine like skin rash or pruritus. These effects impose an immediate stop of the treatment. There are no reports of overdose related to administration of Gerovital® H3. In case of accidentally injection of high doses, severe hypotension, convulsions, coma, respiratory arrest may occur. *Keep out of the reach of children. *Do not use after the expiry date printed on the package. 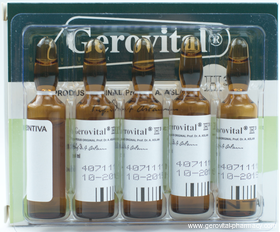 VIALS : The recommended dose is 5 ml (1 ampoule) of Gerovital H 3 intramuscular injection 3 times a week (1 vial of Gerovital H 3 solution every two days) for 4 weeks. TABLETS: The recommended dose is 2 Gerovital H 3 tablets daily, after meals, in the morning and in the afternoon for 12 days. The treatment series will be followed annually, continuously or with a one-month break between them. The schedule and frequency of breaks will be decided by the geriatric physician, depending on the condition of the patient. Hyaluronic Acid ampoules 30 vials - 3 months tratament.